Hint: Click on FAQ title to expand and view description. Clicking on the FAQ title again will collapse it. Creating an account for the School Nutrition Toolbox? From the horizontal menu at the top of the home page, click on the "How to Register link" > menu will expand > click on "Create Account, New Users Only ." New Page Loads > Enter the required information > Click on "Create My New Account" button found at the bottom of the registration form. New Page Loads > Email instructions to follow shortly to complete registration process > Click on the "Continue" button. You will be forwarded to the Dashboard | Home page. Check your email for the confirmation message. Click on or copy/paste the link displayed in this email in your web browser's web address bar. Please note. The confirmation email does not always arrive immediately. Please be sure to check your Junk or Spam boxes/folders in you email client or online email application. Confirmation Page Loads > A registration confirmation message will be displayed. You can begin your study at the School Nutrition Toolbox by selecting the All Courses icon found on the Dashboard | Home page. Click on the Expand Categories link. All the courses found inside the three (3) categories used to organize the courses for the School Nutrition Toolbox will be displayed. At present there are 3 training modules you can enroll for a course in. 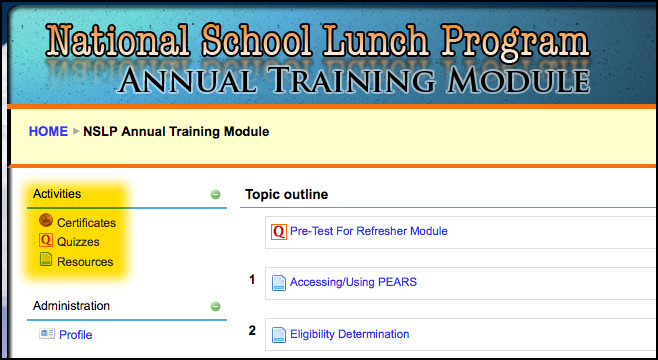 NSLP Administrative Training Module. Composed of 3 courses: Eligibility Determination, Verifcation of Eligibility, and Meal Counting & Claiming. NSLP Annual Training Module (required yearly). NSLP Additional Training Module. Comprised of 10 courses: Civil Rights in the NSLP, Offer Versus Serve (OVS), Overview of School Nutrition Programs, Serving Students with Special Needs, FSMC - Contracting with a Food Service Management Company, Breakfast: The Most Important Lesson of the Day, Fresh Fruit and Vegetable Program, Farm to School: Keeping it Safe, Renewal Year Contract with a Food Service Management Company, and Selecting a Meal Purchas Option. You must have an account with the School Nutriton Toolbox in order tto enroll in a course. If not, please read these instructions Create Account Instructions. At the top of the School Nutrition Toolbox Training Series homepage, from the horizontal navigation bar, roll your cursor over Enroll in a Course menu item. The 3 training module categories will appear. Rolling your cursor over each of the 3 module categories will display the courses associated with each in a submenu. Select a course by clicking on one highlighted by your cursor from the module category submenu. The training site login page will load. Enter your username and password. Confirmation Page Loads > You will be asked if you want to "Enroll In This Course" > Select "Yes" (of course!). New Page Loads > You will be forwarded to the course's Topic Outline page and you can begin the course. Not in Pennsylvania. Can I still register for an account on the School Nutrition Toolbox? First off, welcome! Yes the School Nutriton Toolbox is available for all. You will notice on the "Create New Account" page a required field is for the AUN/PEARS Agreement Number. Please enter the number 7, 9 times with no spaces or hypens as your AUN/PEARS Agreement Number. Users of the School Nutrition Toolbox are eligible to receive Continuing Education (CE) credits from the School Nutrition Association. The following is a breakdown of CE credits issued for each course. I did not receive my confirmation email? There is a possibility your confirmation email was placed in your email program's SPAM Folder or Junk Folder, so be sure to check there first. I have forgotten my password. How do I get a new one? This is a very common issue many users experience. Nothing is more frustrating then having a site reject your password. 1. Click on the Login link in the upper right of the homepage (the login link is next to the sentence, "You are not logged in."). New page opens -- this page allows you to login or create an account. Since you have an account, but have forgotten your password, click on the button "Yes, help me log in." 2. New page opens. Enter either your Username or Email address you registered for this module with (you do not have to enter both). Click the OK button. 3. New page will load. After you have reviewed this message, click on the Continue button. 4. You will be redirected to the homepage. Check your email for your "Confirmation Email." 5. Click on the link, or copy/paste the link in this email into your web browser's address bar. 7. Password change confirmation message will be displayed. Click on the Continue button. 7. The login page will load. Check your email for your new password. 8. This email contains your new password (and your username if you have forgotten this too). 9. Enter your login information, then click on the Login button. 10. After clicking on Login, you will be forwarded to the Change Password Page. or select Cancel to keep the one just emailed to you. In either case, after selecting Save Changes or Cancel, you will be forwarded to your Profile page. 11. After clicking on "Save Changes" or "Cancel", you will be forwarded to your "Profile Page." Click on the "SNT-Moodle" breadcrumb link found in the light yellow "You Are Here" navigation bar. You will be forwarded to the "Course Categories | Home" page. First determine which browser you are using. As a starting point, you might be able determine your browser version by selecting "Help" from the top menu bar." For example, to find your version of Internet Explorer, you would select "Help" and "About Internet Explorer." Some browsers display their version by selecting the browser name from the top menu bar (usually found in the left corner). Use the pull-down and select "About ...". OK ... I have determined which browser, so how do I enable cookies? Below are instructions on how to enable cookies for various browsers. Click on the gear-wheel icon at the top right of the browser window. Set the slider to "Medium". This should be enough to enable cookies on the School Nutrition Toolbox, but it is recommended to add schoolnutritiontoolbox.org to the Sites list. To do this, click "Sites". Enter “schoolnutritiontoolbox.org” in the "Address of the website:" input. Click on the "Tools" menu in Internet Explorer. This should be enough to enable cookies on School Nutrition Toolbox, but it is recommended to add schoolnutritiontoolbox.org to the Sites list. To do this, click "Sites". Enter "schoolnutritiontoolbox.org" in the "Address of the website:" input. * From the browser window, click on the "Tools" button. * Select the "Privacy" tab. * Check your settings to see what level they are at. If they are on "Block All Cookies" or "Medium" you must lower your setting to "Low or Accept All Cookies." * Click the "OK" Button at the bottom, then click the "OK" Button again to close the "Internet Options" window. * Select "Internet Options" from the "Tools" menu. * Click on the "Privacy" tab. * Manually slide the bar down to "Low" or "Accept All Cookies." * Click on the "Preferences" item in the menu >> a new window opens. * Click on the "Security" icon near the top of the window. * Under "Accept Cookies" the "Always or Only from Sites You Navigate to" must be selected. * Save changes by clicking "OK" and go to one of the configuration pages again. * Click on the "Tools" menu in Opera. * Click on the "Privacy" selection near the bottom left of the window. * The Enable cookies checkbox must be checked, and "Accept all cookies" should be selected in the "Normal cookies" drop-down. Especially in Internet Explorer, users will often receive this error when entering their registration information or login information. Privacy settings need to be adjusted. How to Enable Cookies and adjust Privacy Settings for IE 9-11, 8, and 7. 1. Click on Tools and then click on Internet Options. 2. From the Internet Properties dialog box, on the Privacy tab. 3. Slide the bar down to the button of the scale until the words “Medium” appear. 4. This should be enough to enable cookies on schoolnutritiontoolbox.org, but it is recommended to add schoolnutritiontoolbox.org to the Sites list. To do this, click "Sites". 5. Enter "schoolnutritiontoolbox.org" in the "Address of the website:" input > Click Allow > Click OK > Click OK.
3. Slide the bar down to the button of the scale until the words “Accept All Cookies” appear. Why am I receiving a strange error code after I submit my registration information? If the next page you see after you submit your registration displays a error message like this ( Incorrect sesskey submitted, form not accepted! ): Most likely, you do not have cookies enabled in your browser. Consult the FAQ category, All About Cookies. Select the topic How do I enable cookies to address this issue. Cookies are enabled, but I still get an error message when I submit my registration information. You will most likely need to delete your browser cookies. Close your web browser. Open your web browser and return to www.schoolnutritiontoolbox.org, and once again find the course you are trying to register for and click on its' link. Following are instructions to delete cookies in the most popular web browsers. Under "Browsing history", click Delete. Deselect Preserve Favorites website data, and select Cookies. In Firefox 3.5 and above follow these instructions to delete you browser cookies. Use this link to find instructions on how to delete cookies in other web browsers and operating systems. SNP Annual Training | How do I receive my certificate? These instructions apply to receiving a copy of your certificate in the SNP Annual Training Module. The graphic below illustrates the successful completion of the post-test. Still inside the post-test window, select the link from the breadcrumb or link trail (step 2), to begin the process of receiving your certificate. Scroll to the bottom of the topic outline page. 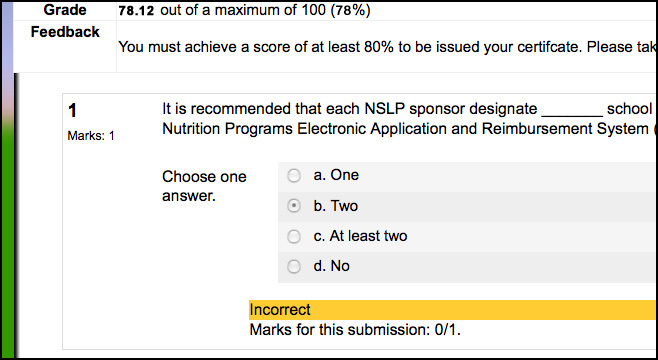 You will find the "Your NSLP Certificate" link. Select this link. Click on the "Get you certificate" button. A few moments will pass, then your browser open a "Save File" window. Make sure you have selected the "Save File" radio button. Check your email (wait at least 5 minutes). Your certificate will arrive as an email attachment. What are the course requirements to receive a certificate? You must complete and submit the post-test. A score of 90% or better must be achieved on the post-test. If you opt to receive the pre-test certificate, then you must achieve 100% on this test. You must complete and submit the practice question results and achieve a score of 80% on each practice question individually (not an overall average of all the practice questions combined) for the course you are taking. You must complete and submit a post-test for the course you are taking and achieve a score of 80%. You must complete and submit the practice question results (click on "Submit All and Finish" button) and achieve a score of 80% on each practice question individually (not an overall average of all the practice questions combined) for the course you are taking. Where is my certificate number/code at on my issued certificate? You will find the certificate code/number at the bottom of your certificate in the center (highlighted in yellow here) just below your AUN/PEARS Agreement number. Step 1:Navigate to the specific module's Topic Outline page. From the Topic Outline page (these steps apply for all the training modules), scroll down this page and find the module's certificate link. Step 2: Click on the Certificate Link. Wait for the new page to load. If you received a certificate for this module in the past, the date will be noted. Step 3: Click on the Review Your Certificate button. Step 4: Your certificate is displayed. Verify that this is your certifcate. Step 5: Right-click anywhere on the certifcate. This will open a save file box asking you where you would like to store your certificate on your computer. Step 6: IMPORTANT! The Save As name and extension must be changed. You will see that the name of the file being displayed to download is view.php. You must rename this file and add the correct file extension for a successful download. Step 7: Rename the file making sure to end the file name with the .pdf file extension. A copy of your certificate will be downloaded to your computer when you click Save or Press the Return key. How do I see which question(s) I got wrong on the post-test? After you have logged in you will be forwarded to the "Topic Outline" page. On the left side of this page is a column with a sub-menu of links. One of these links is for checking your quiz results. The quiz link will open a quiz results page. Both the pre-test and post-test for annual training module will be listed, but you can only view the results for the post-test. Select this link. 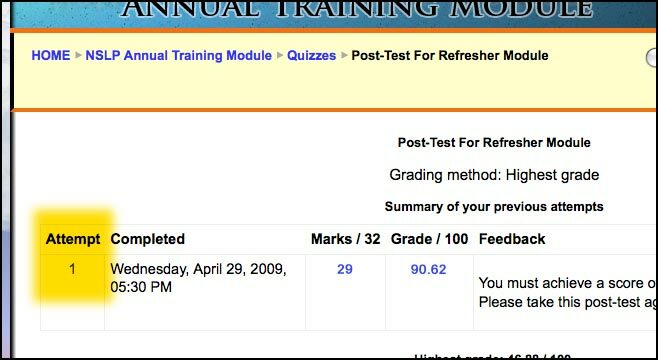 This page displays information about your attempt(s) at the post-test. Select an attempt link number from the left side of this table. This page displays the answers you gave to the post-test questions — correct, incorrect and partially correct — for the attempt number you selected in the previous step. After you are finished, select the Finish Review button at the top or the bottom of this page to exit. I can't tell which objectives I have viewed or quizzes I have attempted? Go to the Topic Outline Page for the course you are taking. From the left sidebar menu, click on the Profile link found in the My Information category. When this page loads, click on the Activity reports tab. Select the Complete report link found in the link lineup below the Activity reports tab. The complete report link will display which topics you have viewed, and when you most recent visit to a objective was. The complete report link also displays your quiz results. I haven't been to site for quite some time. Do I have to "enroll" again for courses I started? No you do not have to enroll again in courses your started quite some time ago. If you can login and see the topic outline page, you are enrolled in that course. Do I need to retake practice quizzes I have achieved the passing score in if I have not logged onto either training module for sometime? Only if you want too. No you do not need to retake these quizzes if you have met the requirements of the course guidelines for passing score in a practice quiz. 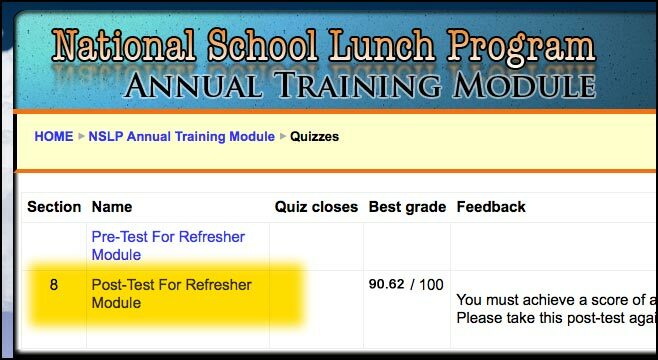 You can check your quiz results by clicking on the Grades link in the Activities sidebar menu on the left side of the Topic Menu page. The password you entered does not match the password stored in Windows for this user name. "But I was able to login yesterday!" So how do we deal with this conundrum? The source of the confusion begins in the "Delete Browser History" control panel found in the "View" menu in the Internet Explorer task bar. If the "Passwords" option is not checked, then Internet Explorer will not delete any of the passwords you asked it to save in the "AutoComplete" dialog box (top illustration), which in theory is a great idea, when you close your browser sesson. When you receive a new password for one of the training modules and enter this new password, you will be presented with the same "AutoComplete" dialog box. Choose "Yes." Your new password will now be saved. Choosing "No" will not replace your old password with the new one. May multiple people from my school district register for the training modules? Do we use the same Username and Password? Yes, multiple members of your school district can use the training modules. Each member must register creating their own account. Separate accounts are required by the training module software in order to keep track of content viewed, grades, and certificates issued. Multiple simultaneous logins from the same school district with separate Username and Passwords are allowed. If for some reason you were to share the same Username and Password, you would see sluggish performance and periods where the system does not appear to respond. Foreground Images Block the Content of the Page. 1. Click once on your desktop with the right mouse button and select Properties from the pop-up menu. 2. On the Display Properties window select the Settings tab. 3. In the area labeled Screen resolution, drag the arrow ( ) to the right until you reach at least 1024 by 768 pixels. Click OK to change your screen resolution. 4. Depending on your computer configuration, you may be prompted to make a choice between restarting your computer, or applying the changes without restarting. It is usually safe to make the changes without restarting. 1. Right-click your computer’s Desktop and click Screen Resolution from the menu that appears. 2. The Screen Resolution window will appear. 3. Click on the drop down box titled Resolution and adjust the slider to change the screen resolution, between 1280×800 to 800×600. Note that you will have to choose the correct resolution suitable for your monitor. Or else the screen may be cropped and some items remain hidden from view. 5. If you are happy with your new screen resolution, click on "Keep changes". If your screen goes black or distorted, your monitor probably cannot cope with the new resolution. Wait for 15 seconds and Windows will revert back to the old screen resolution. 3. In the list of Resolutions: select 1024 x 768 (or higher). Why do I need to have cookies enabled? We send a "session cookie" to your computer when you log in to your account. This type of cookie helps us to recognize you if you visit multiple pages on our site during the same session, so that we don't need to ask you for your password on each page. Once you log out or close your browser, this cookie expires and no longer has any effect.